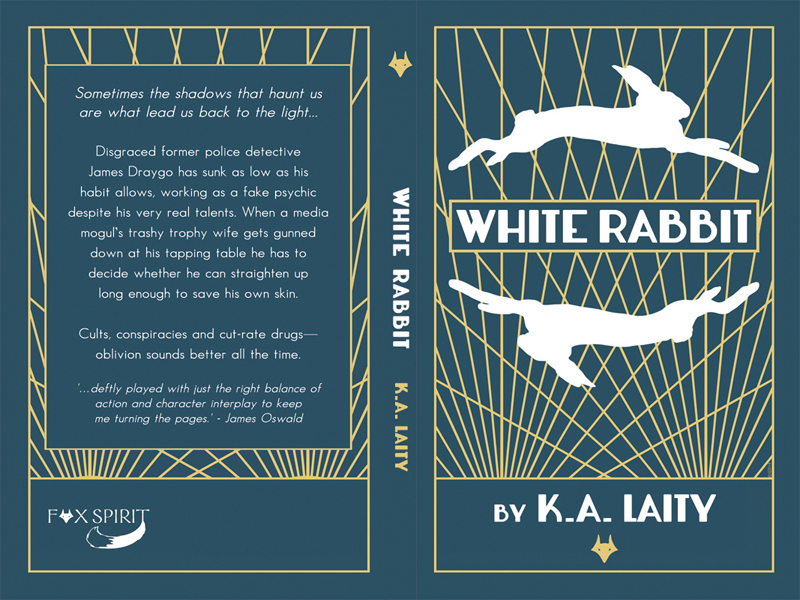 I am very pleased to announce that my book White Rabbit is out NOW from Fox Spirit Books. Just take a gander at that wonderful cover by S. L. Johnson AKA the Queen of Everything. I can’t wait to hold the shiny in my own hands, so I’ve decided to share the wealth and give away a signed copy of the book to one lucky person here. And I’ll throw in a little chocolate because it’s Easter (well, Annandag påsk anyway). Contest ends Monday April 28, 2014 at noon GMT. Read an excerpt and be sure to sign up for the Fox Spirit Newsletter to get the latest skulk news! LOL, I was afeared Chas & Dave would appear here, but so soon?! Hahahahahahahahaha! A man in a movie theater notices what looks like a rabbit sitting next to him. “Are you a rabbit?” asked the man, surprised. Q: What do rabbits do after their wedding? A: They go on their bunnymoon! Q: What do you get when you cross a rabbit with a leaf blower? A: A hare dryer! 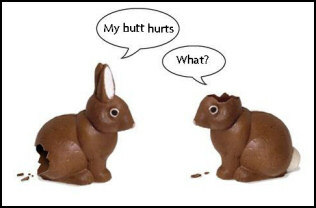 What did the naughty rabbit get for Easter? Hahaha! Two in a row. Hee! A receding hare line of course. LOL, the advantages of living in Ireland! Oh, no! I knew the sheep jokes from long ago. I was raised by grease monkeys, don’t forget. Why did the white rabbit miss his own funeral? He’s called the Easter Bungee! What Kind of Books do Rabbits Read? Why was the rabbit in hospital? He was having a hare transplant. Apologies if this is a duplicate, bit of chaos (on my part) resetting my password. And now I’m distracted realizing my avatar is me & a white rabbit. Total coincidence. So yes, where were we? Oh yes: What weighs 7 tons and is 65 million years old? A rabbit riding a T. Rex! This is turning into a bun fight. If another lassie wins, I might Thumper. Oh groan — if this keeps up I will pull all my hares out. I knew a rabbit once who went out and bought himself a wonderful new toasted sandwich maker from Argos. Soon enough he was cooking up a storm, making toasted sandwiches with cheese, cheese and tomato, ham and cheese, ham and pepperoni, Hawaiian ones, ones with just ketchup, he was in his element and every time I saw him he’d tell me of some new concoction. I didn’t see him for ages, and when I went to see him he was looking thin and frail, and his sandwich maker was notably absent from the kitchen. Ha! I like that one. HAHAHAHAH! >_< Oh dear. I think I'm going to have to make a random choice. There's just too many good ones. Congrats, Tess. That one pretty funny 😉 They were all brilliant. Great showing! It was impossible to choose. I hate choosing when I like everything!